This reissue of the Decca Elektra originally released in 1967 is presumably designed at least in part to extend the shelf life of a recording that would otherwise be about to lose its copyright protection and be open to ‘pirate’ remasterings. It also forms part of a handsomely packaged collection of some of Decca’s superlative catalogue of operas from the period including Karajan’s Bohème and Tosca, Sutherland’s Lucia di Lammermoor and Rigoletto, and Solti’s Salome and Aida as well as this Elektra, all of them well worthy of this respectful treatment including remastering at 24-bit 96kHz and Blu-Ray audio. The back of the hardback book states that this is a “limited edition” but, unlike the luxurious edition of the Solti Ring produced some years ago, there is no number of issues specified or inserted on the packaging. John Culshaw, the producer of this recording, never reached this point in his career when writing his autobiography Putting the Record Straight, left unfinished at the time of his death; but Elektra was one of the last of the series of famous Decca ‘sonicstage’ blockbuster productions that he mounted during his years in charge of the company’s programme in Vienna. 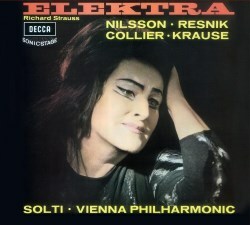 The same principals – Birgit Nilsson, Regina Resnik and Georg Solti (not then knighted) – featured in a famous series of staged presentations of the opera in London contemporaneously with the release of the Decca LP set. Enthusiastic audiences not only mobbed the stage door at the end of the performances but, it is reported, also followed the singers and conductor down the street while continuing to applaud. Stories about the production even made the pages of the popular press, in a manner that was not to be rivalled for many years until a very different operatic presentation made a very different form of impact in Jerry Springer: the Opera – and for very different reasons. Mind you, Elektra had always had the ability to excite audience enthusiasm in London. Back at the time of the Covent Garden première in 1910 the young Thomas Beecham (also not then knighted) had established his reputation with a series of performances that were the talk of the London season, and excited a vituperative exchange of correspondence in the press between Ernest Newman and no less a figure than George Bernard Shaw. The opera itself was even bizarrely subjected to an arrangement for military band which was played at Buckingham Palace; it is said that shortly afterwards the bandmaster received a communication on the lines of “His Majesty does not know what has the band has just played, but it is never to be played again.” And indeed performances of Elektra continue to retain the ability stun audiences to this day, provided that the presentation is adequately sung and played. Culshaw in his autobiography relates how he came under pressure in the early 1960s to record Gerda Lammers’s assumption of the role at Covent Garden under Rudolf Kempe, and how difficult it became to refuse such demands (a live relay has subsequently appeared on CD). In the theatre the impact of Strauss’s score can be overwhelming in a manner than can completely undermine the critical facilities. On disc, for repeated home listening, unless one is seeking to recapture a specifically memorable occasion in the opera house, one can be more selective. Indeed, when revisiting this recording of Elektra after a period of fifty years, the reviewer really needs to confine such comparisons to those sets made (like this one) in the studio and specifically designed for home consumption. Recordings made in the theatre inevitably, in a score as complex and demanding as this, will contain slips and minor fluffs which would readily be overlooked in the thrill of the moment but which could only become irksome on repetition. Theatrical performances also give rise to a second consideration. The title role, in particular, is a real strain on the resources of any singer; and from an early stage Strauss appears to have reluctantly countenanced cuts in the score to lighten the load for his leading soprano. A chunk of some three pages of vocal score towards the end of Elektra’s scene with her mother is almost invariably omitted; a second cut is often made in the following scene between Elektra and her sister (it has been suggested that this may have originated in an attempt to avoid lesbian undertones in the text); and further snips, which may or may not have been authorised by the composer, are also made by some conductors. However, whereas Strauss was quite willing to publish scores of his earlier operas such as Guntram with the cut passages omitted altogether, he never for a moment seems to have anticipated that the ‘theatre cuts’ which he tolerated in Elektra would be adopted in all performances – indeed, he not only retained all the deleted passages in the score, but did not even give any indications (in footnotes, for example) where such elisions could be made. For this reason it astounds me that conductors and singers continue to countenance them, even when there can be no suspicion – for example, with a live performance by Evelyn Herlitzius which I reviewed a couple of years back – that the retention of the passages would cause any additional strain to the soprano. Having said which, it is surprising that the first studio recording of Elektra, issued by DG some five years before Solti’s Decca set, perpetuated these theatre cuts. Or perhaps not so surprising, when Karl Böhm was on the podium. The willingness of this conductor to accept the abridgement of the operatic scores of a master he so admired (Strauss even dedicated Daphne to him) never ceases to amaze me. His performances of the music that remained were superlative – no conductor in my experience has come close to capturing the whirlwind strings that surround the horrendous passage as the ‘Spirit of Agamemnon’ theme rises menacingly through the octaves at the end of Elektra’s dance – but he seems to have extended his notion of the ‘conductor’s contribution’ beyond all reasonable bounds, and nearly all of his recordings of Strauss’s operas suffer from disfiguring cuts which he applied with an increasingly heavy hand as he grew older. In point of fact, this is not the worst example of Böhm’s editorial excesses in Elektra; his later video version for Decca hacks the score about unmercifully, a practice which is even more unforgiveable when the excellence of his cast is taken into consideration. The DG studio set is far less impressively sung – only Dietrich Fischer-Dieskau as Orestes comes close to eclipsing the competition elsewhere – and the recording balance, with the singers ridiculously close by comparison with the orchestra, does the score no favours either. Another much more successful studio recording, that conducted by Giuseppe Sinopoli for DG, is among the best sung of all; it was even recommended by the Penguin Guide above the Solti, but its sojourn in the catalogue was brief (it remains available at full price from ArkivMusic), and for some quite unfathomable reason it was also subjected to cuts. There do not appear to have been any subsequent studio recordings of Elektra at all, the massive number of representations in the catalogue all deriving from live performances in concert or the theatre. Which leaves, surprisingly, only two absolutely complete studio recordings for the home listener: the Decca version under consideration here, and the Sawallisch set for EMI originally issued in 1990 but now available in two different mid-price reissues. Sawallisch’s singers are generally an impressive team. Cheryl Studer, at the height of her all-too-brief career, is winning as Chrysothemis; Marjana Lipovšek gives a carefully studied portrait of psychological decay as Klytaemnestra; Bernd Weikl is youthful-sounding and forthright as Orest; Hermann Winkler is effectively nasty as Aegisth; and even the small role of Orestes’ tutor is cast from strength in the shape of Kurt Moll. Sawallisch is less frenetic in his approach to the score than Solti (although surprisingly quicker in places), but then Elektra is a score where surface excitement counts for a great deal. And where Sawallisch does suffer is in the performance of Eva Marton in the title role. At the time of the recording her voice was steadier than it was to become afterwards, but there is still an insecurity of pitching which undermines her intelligent interpretation and characterisation of the part. And when one compares her assumption with the total assurance of Birgit Nilsson for Solti, there is really no comparison at all. Not that Nilsson is absolutely perfect (there is the very slightest suspicion of flatness as she softens her tone in one or two places during the recognition scene) but she remains still an Elektra unsurpassed in the modern era – as can also be amply testified by the many recordings of her live performances which have now found their way onto ‘pirated’ or ‘unofficial’ CDs. Her sarcastic exchanges with her mother have just the right sense of sly insinuation, and on many occasions she fines her voice down to a silvery sliver of sound that can chill the blood. Warmth of tone does not come easily to her, but in the passage where she is mourning her supposedly dead brother she substitutes a sense of desperation which harrows the senses. Of course much of Elektra demands a ruthless power of delivery which is right up Nilsson’s street; time and again she delivers with rock steadiness scything passages which leave the listener breathless. This heroine is a Turandot for whom the ice will never melt, and her final death sounds here like an inevitable conclusion rather than a convenient one. By comparison with Nilsson the remainder of Solti’s cast are rather less special. Best is Regina Resnik as Klytemnaestra, plunging into the lowest depths of the contralto voice with sinister effect but showing some signs of strain on the highest notes; her offstage laughter and screams, aided and abetted by Culshaw’s echo-chamber effects, come straight out of the mouth of the Wicked Witch of the West. Marie Collier’s howling as she comes to announce Orestes’ death is horrible in exactly the wrong sense, although it hard here to see exactly what effect Strauss intended; but elsewhere she is passionate and involved, and I find it difficult to appreciate the objections of those who find her pallid. Tom Krause is bold and forthright as their avenging brother, although Fischer-Dieskau finds unexpected subtleties here. Gerhard Stolze is rather a trial as Aegisth, characterful as ever but resorting to Sprechstimme far too often and badly off-pitch as he is murdered. The workmanlike Tugomir Franc as the Tutor merely serves to demonstrate the importance of casting this role from strength with Kurt Moll (for Sawallisch), Josef Greindl (on Böhm’s video) or even the young Gustav Neidlinger (for the very first 1944 recording of the score under Jochum). Solti does however score with his superb quintet of maids in the opening scene, with a starry roster beginning with Helen Watts and Yvonne Minton, and supervised by the Overseer of Pauline Tinsley (herself a superlative Elektra in the theatre). For some reason the chorus is omitted from the list of credited singers in the booklet (as they were in the 1986 CD booklet); they are excellent in their brief contributions towards the end. The dates given for the recording sessions in the booklet, by the way, are similarly clearly incomplete. Elektra is of course a one-act opera, and the idea of inserting an interval into a work of such concentrated passion is unthinkable. But then of course on CD it is necessary to find a suitable point to change discs, and Strauss himself seems to have anticipated the possible need for a break by restarting his rehearsal numbers at the beginning of Scene Four, just before the howling Chrysothemis enters bearing the news of Orestes’ reported death. That is precisely where most CD sets make the break; although there are moments of silence shortly afterwards, these are dramatic points of stillness where prolonged silence would be equally damaging. The provision in this set of a Blu-Ray disc, of course, obviates the need to get up and change the disc, and allows us to hear the music in a long uninterrupted span. The side breaks on the old LPs were ruinous in this respect, although the first CD issue restored the proper continuity. Yet again the engineers have failed to appreciate this, as indeed they did in their Blu-Ray Siegfried some years ago. At the point where the old LP and CD sides changed, we find inserted a brief silent pause in the music where none was intended by the composer! This is by far from being the only time when I have registered complaints about such a cavalier approach to the transfer of material onto more continuous modern mediums, and in the case of Elektra the offence is even more heinous because the engineers of the original CD transfers got it right when connecting the music over the LP side breaks between sides 1 and 2, and between sides 3 and 4. Now when I raised my complaint about the similarly damaging interruption to continuity on the Blu-Ray disc of the Solti Ring, a later reviewer in Fanfare took exception to what he described as the cavils of a “Wagner purist” (at least I presume he was referring to me, since so far as I can see nobody else who reviewed the set saw fit to mention the matter at all). As I have said before, if asking record companies to produce premium-price product which gives us the score as the composer wrote it without the insertion of entirely artificial pauses makes me a purist, I am happy to plead guilty as charged. But it should surely not be beyond the means of the record companies concerned (and Decca are by far from being the only offenders in this matter) to employ someone who can read a score to check such matters out. Simple, really; once upon a time record companies would have taken such precautions as a matter of course. As it is, if such concerns can be dismissed by reviewers as minor, then it is not so surprising that companies will continue to produce material which spoils the ship for a ha’p’orth of tar, as I observed about the similar and even more glaring error in Siegfried. And if the principal reason – the ability to hear the music as Strauss wrote it, in an unbroken span without fictitious interruptions – for having the opera on Blu-Ray is so obviated, what is the purpose of this reissue? The sound on CD is improved in clarity by the remastering, but then it was pretty impressive on the older transfer anyway. The booklet notes have been somewhat expanded – the essay by Gerd Ueckermann now comes with an English translation to add to the original French and German, the essay by Michael Kennedy has French and German translations added to the original English, and there is now a parallel French translation of the text alongside the originally provided German and English – but is that really enough to encourage those who already have the 1986 CD box to replace their copies? And it is all the more annoying, when just the slightest degree of thought regarding the Blu-Ray transfer could have made the argument for such an ‘upgrade’ so compelling. For those who don’t already have the Solti recording of Elektra on their shelves, on the other hand, this reissue should spur them to rectify the omission. The back cover of the book (which contains the printed material and discs contained in well-bound sleeves) contains a Gramophone review by Edward Greenfield which refers to the recording as “undoubtedly one of the greatest performances ever on record.” And it is.